Everything from the chassis, transmission, engine and suspension to the cabin has been changed in the new Actros truck from Mercedes-Benz Commercial Vehicles – part of Daimler Group, according to Al Haddad Motors. 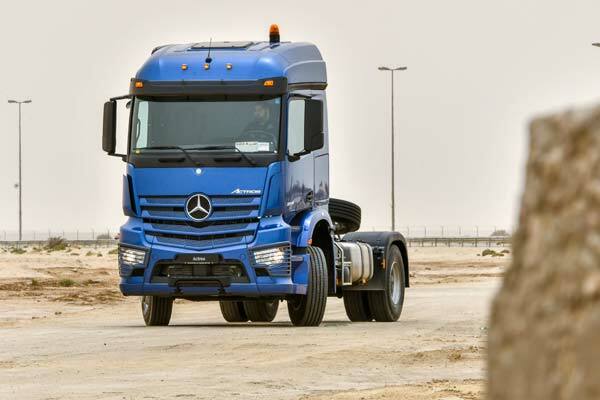 The authorised dealer Mercedes-Benz in Bahrain saw the launch of the all-new Actros and Arocs trucks at its showroom in April. Actros is one of Mercedes-Benz’s most popular models in the region with more than 100,000 units sold in a 20-year period. The heavy-duty vehicle has been developed mostly for transportation applications both for long haul and short-radius transport and distribution. At a test drive, Trade Arabia had a close look at the new truck, driven for the purpose by Yasser, a certified trainer at Al Haddad Motors. Starting from the exteriors, the truck has its specification marked on the doors for easy recognition by the driver depending on the type of job it is assigned for. For example, our truck had ‘2042’ inscribed on it - 20 standing for 20 tonnes and 42 indicating 420 hp. Getting inside is made easy with steps and long grab handles. The cabin is spacious – both wide and tall – with enhanced visibility (180 degrees). Large side mirrors and curved mirrors increase the visibility range, an important factor on Bahrain’s roads when small vehicles cut you off very often. The suspension seats add to the driver’s comfort. There are also large stowage spaces above him. And behind the seat is a large sleeping quarter for the driver to catch on sleep on the long haul journeys. Powerful air-conditioning helps beat the scorching Gulf heat. The curved dashboard brings everything within the driver’s reach. An LCD panel offers instructions in 34 languages and tools that allow to check the truck’s vital signs, including a smart feature that tells the driver about his driving. The steering wheel has buttons for the accelerator, cruise control, Bluetooth phone calls and radio settings. Keys for the Actros come in normal and remote control options. An option is a multifunction smart key with an LCD screen that shows the driver checkpoints like battery power, tyre pressure, and temperature inside and outside, when he is outside the truck. The key also allows to control window panes and lights. A highlight is the truck’s anti-theft feature: For short-haul jobs that might require the driver to frequently exit the truck, he can now remove the key from the ignition switch and the engine doesn’t shut down - and in an untoward situation of the truck being stolen, it will not drive faster than 10 kmph without the key. The 18- to 44-tonne Actros comes with a choice of powerful six-cylinder in-line engines: 10.7, 12.8 and 15.6-litres, giving outputs ranging from 360 to 578 hp. There are two transmission types: 12 and 16 gears. Oddly enough, automatic transmission is a standard and manual an option on the Actros. The suspension elements have been redeveloped and perfectly tuned to one another: from the suspension in the seats and cab mountings to the new leaf spring suspension; put together, it all produces maximum suspension comfort in the workplace. The PowerShift 3 on the truck allows precise gear selection and fast gear-changing, resulting in lower fuel consumption and better overall economy of the vehicle. Transmission shifting is smoother in the new Actros than its predecessors. The engine brake feature uses the engine as a compressor when braking. This shifts the load off from the brake pads, adding to their long use and more saving. The optional Active Brake Assist 3, meanwhile, helps prevent an imminent collision with a stationary obstacle. An interesting feature on the Actros is the ability to drive in reverse at speed. The truck can be optionally fitted with up to four gears that allow it to drive up to 30 kmph – a feature that is useful in lengthy worksites where turning around can be a hassle due to space restrictions. The Arocs truck is designed for applications which require a particularly robust vehicle design. It is intended first and foremost for the construction industry or severe off-road use. From platform vehicle to concrete mixer and heavy-duty tipper, the road and all-wheel-drive variants of the Arocs offer a particularly tough and robust vehicle to meet any challenge even in desert, gravel or paved conditions.